Singapore, 08 August 2011 – Race promoter Singapore GP has unveiled the addition of yet another Grammy-award winning artiste BOY GEORGE to the world-class entertainment lineup for the 2011 FORMULA 1 SINGTEL SINGAPORE GRAND PRIX. BOY GEORGE joins previously announced performances by Shakira, Linkin Park, Shaggy, Rick Astley, Charice and Massive Attack's Daddy G & 3D. Consummate showman, DJ and icon BOY GEORGE is a crowd-pleaser with his rich, soulful voice, flamboyant persona, and grandiose costumes. 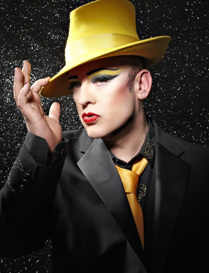 Zone 1 ticketholders will be able to catch BOY GEORGE Live by Avalon in a one night only performance featuring his greatest hits and chart-toppers like 'Karma Chameleon', 'Do You Really Want To Hurt Me' and 'Bow Down Mister' at the Village Stage (Zone 1) on Saturday 24 September. "Building on the glamour of the only Formula One night race, we've packed all three days with an extensive entertainment programme featuring the biggest names in music, stunning theatrical-visual productions, retro showcases and electrifying parades," said Michael Roche, Executive Director, Singapore GP Pte Ltd. "Fans only need the one ticket to enjoy both the thrilling track action and all-day entertainment, making a ticket to the Singapore Grand Prix truly value for money." Zone 1 tickets are priced from S$448 for a three-day Premier Walkabout ticket to S$1,288 for a three-day Turn 1 or 2 Grandstand ticket. All Zone 1 tickets allow patrons access to the Village stage in Zone 1.